Hope you’ll come back and visit soon! Well, Sew Mama Sew is at it again!! Another Give-A-Way day today!!! Awesome! :) Make sure and go to Sew Mama Sew to see the HUGE list of people hosting giveaways on their blogs! I will be entering ALL of them! ;) OK. Let’s get started, shall we? Well, let’s give a camera strap slip cover away HERE – on my blog! :) International residents welcome!!! If you are new here, and don’t know what these are, let me explain. I am a photographer in Arizona. I found that my strap was really uncomfortable and rubbed my neck raw. That’s when I decided to make camera strap slip covers! Comfortable and stylish! Say good-bye to that red neck!! 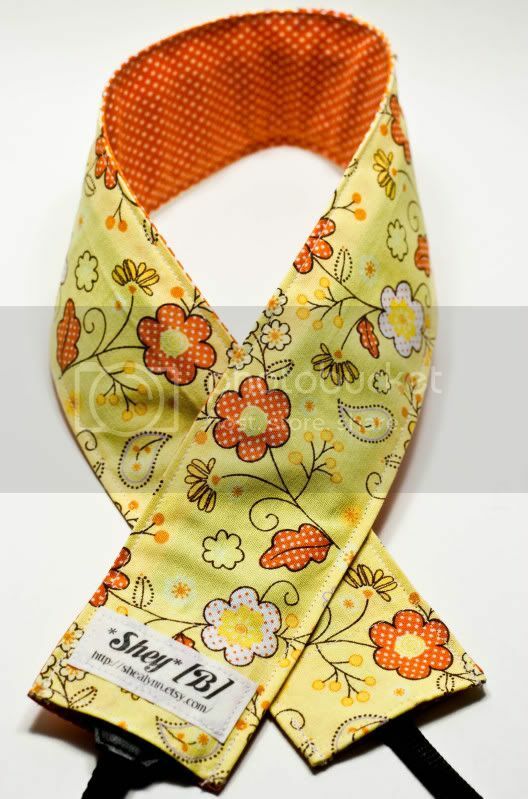 They aren’t sewn onto the strap, so they are completely removable and washable! And, you can change them out when you want a different look! We ALL love our cameras, so why not “dress” them up? Please be sure and check back to see if you’ve won! FOR 1 BLOG ENTRY POINT: Go to my shop – pick a camera strap slip cover that you like best. Come back here, leave me a comment, and tell me which you like best. FOR 10 EXTRA BLOG ENTRY POINTS: Blog/& or Twitter about this giveaway! You can follow me on twitter by clicking HERE. Or follow *Shey*[B] by clicking HERE. PLEASE NOTE: Limited Editions, Minky, Personalization and Lens Cap Pockets Aren’t eligible for giveaways. Giveaway ENDS on Saturday night at 11:59pm!!! Winner will be chosen via random number generator, and will be announced Sunday. If you want to stay a while and cruise around my blog, please do!! Wow! Am I really the 1st one to enter?! Well, I already have one of your AMAZING slip covers – but I could always use 2 right? I'm going to be getting a new DSLR soon! So, I can't wait to get it & put my snazzy strap cover on it! The french girlie wallpaper one is nice, and I always love the red damask! My favorite product is the lens case, but my favorite strap is the Poppyfield Dreams one! It’s so cute! Oxford Rose or Avocado? Oxford Rose or Avocado? Oxford Rose or Avocado? Oh I just can’t decide, lol. All of your covers are super cute! My favorite is the French girlie wallpaper. I love that you are doing matching lens cases now. There are so many cute straps it’s hard to choose one. Cha Cha Carnival Camera Strap Slip Cover. Very cool! I am really digging the Feathered Friends Camera Strap Slipcover. I love the birds on it. I just stumbled on your blog and I love the idea of camera strap covers. I love the pink on pink one! These are sew nice and would make life easier! Love the french girlie with the lens pouch…perfect colors! Thanks for the chance…I love your color choices. Well, the turquoise and brown damask with minky is HEAVENLY! It says not eligible for giveaways though, so I’m not sure if that’s ok to post as my favorite?? If not, my second favorite is the Pistachio Damask… hmmm guess I like damask! haha! You make it so hard to pick one! 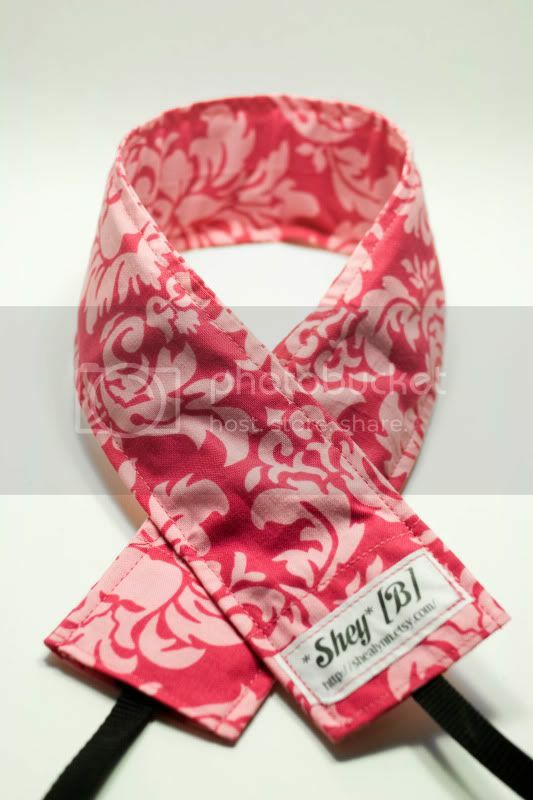 But I thought of my hubby and that he probably wouldn’t want something pick and flowery around his neck so I picked the red and white damask. I like the Passion Damask slipcover. Very cute! My black strap always reflects off of my purse frames, so I’d love to cover it with something less dark. Ok,it was a tough choice between two,but I have narrowed it down to the Hoot Hoot Strap,it’s just too sweet! I like the poppyfield dreams ones. I have had a camera strap tutorial bookmarked for months now with the intention of making my own, but I always work on things for other people instead. I also put a post on my blog about your giveaway along with a few others! I love the Pistachio Damask. Beautiful! I love the passion Damask camera strap. I love pink! Thanks. I am a follower, Thanks! I just bought my first good camera this weekend and I hate the strap advertising canon cameras so shamelessly and you are totally right – it is making my neck red and sore! SO creative. I love the Gothic Rose fabric. 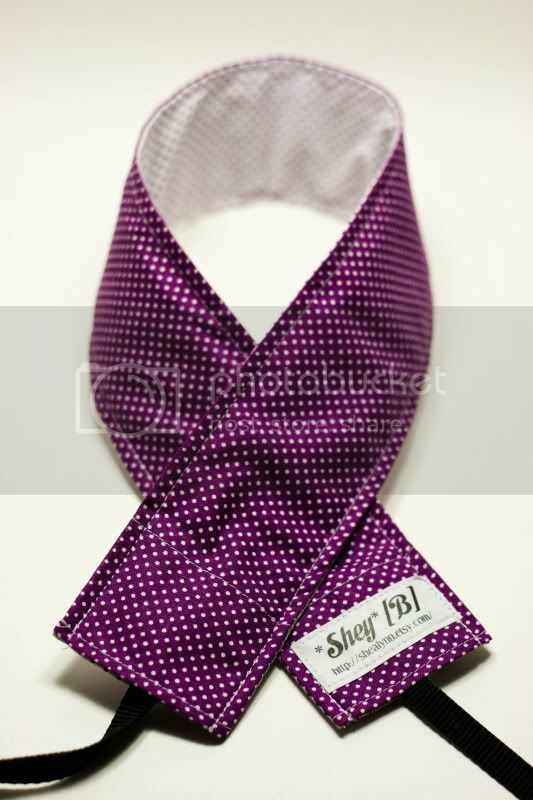 LOVE the purple with white polkadots! Following your blog too! WHOOHOO! These are great.. I like the Classic Black and White Damask. The new lens bags are great too!! I definitly like the Passion Damask the best! Gothic Rose is ONE of my faves. My #1 fave is French Wallpaper :D It is beautimus. So so sad it is being discontinued :*( This would make an amazing gift for my sister her B-day is coming up soon. The black and white straps are fabulous! My sister owns one of your slip covers and loves it! I want one now too! 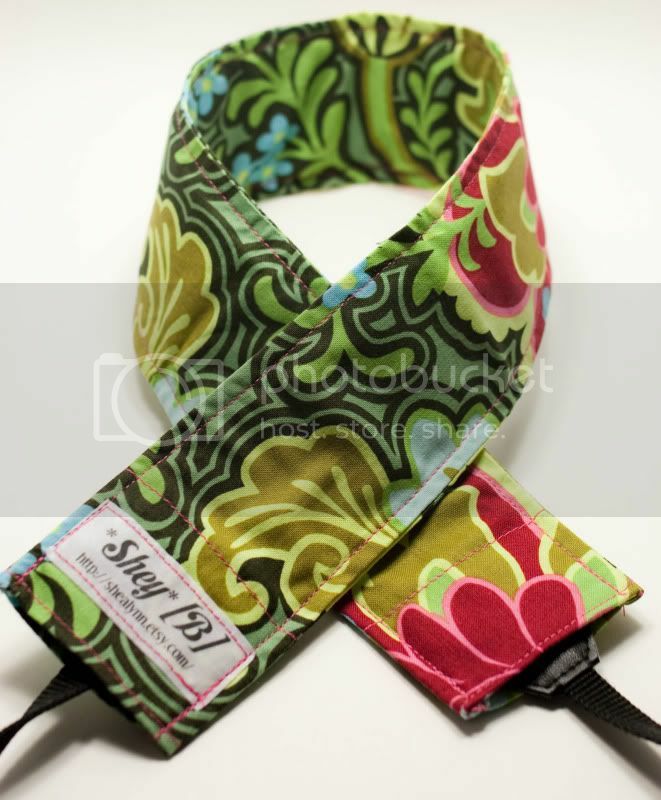 I love the Pistachio Damask Camera Strap Slipcover! So many great ones to choose from, but I would have to say I really love the French Girlie Wallpaper! Add me in for another 5 because I am already a follower! I love the spring flowers cover, so fresh and fun! They are all lovely though. I like the martini strap! Please save my red neck! I love the Gothic Rose strap. I love all the damast designs- and I’m so in need of one of these. I love the Pistachio Damask and the Gothic Rose (of your new options). I don’t know if I could choose one between those two! I love the fruit punch one the best. But they are all gorgeous! I love the tiled fire one…it’s gorgeous! Oh you know I am all over this one. I love a few of your covers, Maybe something in pink. I was really sad to hear about some fabrics being discontinued that you use. I can’t wait to see some tof the new ones you pick though. i love the spring flowers strap! gotta be the poppyfield dream for me. I love it! I’d choose the French Girlie WAllpaper strap cover. They are all so pretty though. the lens case is just great ! I would have to say Oxford…now I forgot but it was a stripe or standard black/white. I already follow you, as you know. I just finished reading Tithe—LOVED IT and am now reading the other one. Thank you so much for sharing. what a great idea, I’ve never even seen these, but are OH SO CUTE!!! I love your Skull and cross bones, and groovy guitars. real cute! I love the Feathered Friends strap! I haven’t seen that fabric before. My DH and I are in a little competition with each other… if I win I get a new DSLR camera (and if he wins he gets a new TV)… one of these straps would look great on my new camera! I'm a follower & blogged about ya. My favorite is the skull and cross bones cover. My husband is a photographer and I’ve been looking for something like this for him, but usually they are very feminine. This one is perfect! Thanks so much! I like all of them, but I especially like your lens covers! I just added you to my favorites on Etsy! Thanks. I am already a blog follower & a twitter follower. My favorite is the French Girlie Wallpaper Camera Strap Slipcover – LIMITED EDITION FABRIC. Thanks for the chance to win! I like the new lens covers! My favorite strap cover right now is the vintage flowers one, but I always change my mind! purple polka dots — what could be better! Love it! Wow! What a great giveaway. I don’t have one of those cameras, but my SIL would love one on hers. I like the turquoise and brown damask. Count me in! i love the Hoot Hoot strap! AWWW, I love the spring meadow one! it’s seriously cute! Love the manly looking straps! very cute, I like the one with the little birdies. Hello! Brand new reader here! Linked to you off of Donna Downey’s blog. How fortuitous this is! I just got my first dslr last night. I’ve been making my way through the owner’s manual, with camera hanging around my neck. I’ve got a kitchen towel around my neck cause… it’s rubbing my skin raw! Never even thought of covering the strap. Anyway… brilliant! I’m loving the poppy field fabric. Thanks ever so much for the chance to win! I love the Spring Meadow strap. Actually, I love SO many of them, but I think that one is my favorite. I love avocado damask but would love to own any one of these!! wow! so hard to choose! loving your fab fabric choices! i love: poppyfield dream, gothic rose, and spring flowers. love them! the moorish espresso is lovely and not too girly that my hubby would allow me to put it on his camera that i want to use. 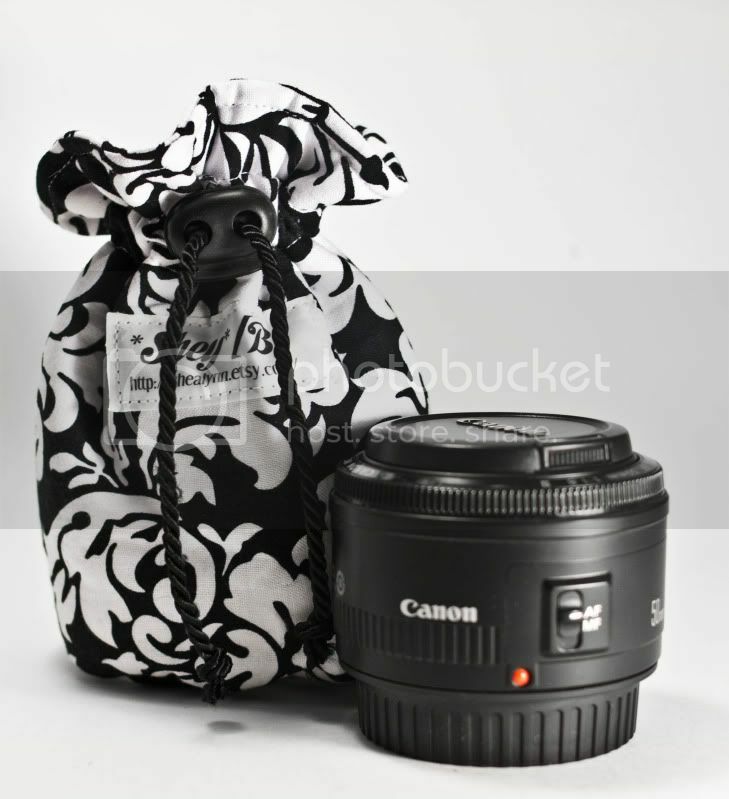 :) the lens bags are a great idea and in fabulous fabrics. i might have to buy one for my mom’s birthday. it’s coming up soon…she’d love fun and funky fabrics. I would have to say the red damask, this would look so good on my camera! If I am the lucky winner, you can contact me through my website http://www.radseams.com. My favorite is Gothic Rose !! I love your shop. Wonderful blog & shop! I just got a new SLR, so a strap cover would be perfect! My favorite is Gothic Rose Camera Strap Slipcover – beautiful work! And, I’m a new follower! I really like the Fanfare Strap and the blue and Turquise. Cute, cute. I love the pistachio one! Fun giveaway! Thanks for the chance to win! I would buy one right now but my birthday is coming up and I sent the link to your store for my Mom and Sister to get one strap cover and one lens bag (by the way that is a great idea) for me. I wouldn’t mind a freebie though. LOL!! I’m going to resend them the link though since you have the bags up now. Gives my sister an idea of what to get me! I love the Hands of time strap cover. It’s got the be Light Blue Damask – the colour is just georgous. Fingers crossed. I love pistachios (especially pistacchio flavored gelato) and I love damask. So what could be better than the Pistachio Damask? P.S. These colors match my baby sling and car seat cover. Wow, these are great! I love the red & white damask. I'm going to follow you and blog about this as well – more chances for me! I love the Morning Glory one! And I’ve linked to your blog on mine :) The lens case covers are fabulous too! Hi there, this is a fab giveaway. Sorry about this I have two kidlets sitting beside me so we all chose a different band. me- Lava leaves, Juliette- morning glory and Django- fire hot. If we are lucky enough to win any one would be fine. so many patterns i liked, but i liked the woodsy pattern the best. and i love your lens bags, i’ll have to come back for one of those! I love the Red and White Damask! So pretty! I think the vintage flower dot is my favorite… but I also really like feathered friends and morning glory! i love the classic black damask with the fuzzy soft backing-yum! I love the first one at the top of the post, but I’ll take anything :D I really need one of these. I hate that uncomfortable strap. does buying a gift certificate for a teacher count? if so…count me in for the extra entries…i want one too:) hee hee! Love the French Girlie Wallpaper Camera Strap Slipcover. I love the new morning glory slip cover and the spring flowers. I’m a sucker for black and yellow! I love the Fruit Salad one, although it was a tough decision as there are so many gorgeous choices! Very Cute! Love the idea. I like the Cha Cha Carnival Camera Strap Slip Cover – they are all great! I have been eyeing your straps since I saw them on Ali Edwards blog! posted about your great give-away on twitter! The avocado damask is GORGE!!! But any of them are lovely…thank you!!!! My husband would probably complain (it’s his camera too) but I would totally use the Fanfare camera strap cover! i am absolutely in LOVE with the avocado damask strap slip cover! i love the french girlie camera strap! I love the turqouise and brown strap! These are so cute and I would love to show one off for you! My favorite is the light blue damask. Very nice! I love the Pistachio Damask and the Tiled Fire. Thanks for the opportunity! Goodness, I've ALWAYS loved the ChaCha Carnival one! My sister is a photojournalist, and I know she would love to have one of these–I like the French Girlie one the best! Love the camera straps! My Hubby is a photographer. Would love to give him one. I like the woodsy one a lot! Love the Feathered Friends Camera Strap Slipcover – definitely want one! I love the Moorish Espresso Camera Strap Slip Cover. my favorite is a bit classic, Red And White Damask! Although I’ve subcribed to your RSS I’m now a follower too! Keep up the great work. French girlie wallpaper is my fav!!! I really like your new Purple Polka strap. Neat that you’re making the matching lens bags. Thank you for entering me in your drawing. I think my favorite is the Pistachio Damask but there are at least two others that I’m waffling between. Thanks for sharing the great giveaway! the cloudy sunset one is my favourite – they are a great idea, many thanks for offering such a lovely giveaway! This is just what my worn out camera strap needs!! My favourite is the Spring Flower. Did you realize you said the contest ends Saturday and you’d announce the winner on Friday????? Great giveaway!! I love the pistachio damask camera strap! I’m trying my hand at photography and this would be perfect for me!! I have always loved your covers. Great fabric choices but my guess I am a classic black and white kind of gal. What a great idea to have a pocket for your lens cap, too! Love the lens cover bags—-great idea! Frenchie Girl wallpaper pattern. Nice fabrics! I love the Pistachio Damask. So cute. These are amazing. What a fab idea! i love the fanfare slip cover. If I don’t win I’m coming back to buy……….Cha Cha Carnival. I have loved this fabric since I bought my first 5 yards of it! And this would look so cool on my new camera. Thanks for the giveaway. And for the extra chances to win I follow you. You have so many beautiful strap covers… it’s hard to choose my favorite! But I am partial to the ‘Lava Leaves’ design. Love the bold prints, especially the french girlie with lenscap cover (gotta have lenscap cover… mine ends up in the backpocket of my jeans and then falls out when I crouch and gets lost….). Great idea and great giveaway ! Thanks ! I love the Passion Damask cover! The Light Blue Damask Camera Strap Slipcover is my favorite. Cute! i love your lense sleeps ! i think, it perfect with my camera strap ! These are great! I’m a photographer in Dallas and I love things that can be girly and stylish and still practical. I can’t decide between the Gothic Rose- because it is awesome, and the spring flowers- because it matches my shootsac. Following you on twitter, and trying to follow the blog via RSS feed but it’s not working for me right now. I’ll have to try back later. 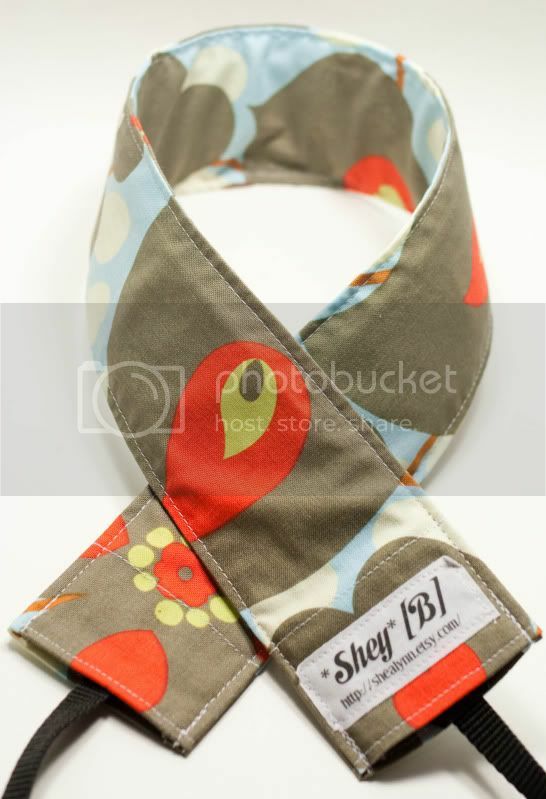 I really like the brown and teal print, as well as the pink on pink in your main photo of your camera strap slipcover. How to choose a favorite?! You have so many gorgeous options!! I love the brown and green one! I also am now following you on twitter and RT’d the giveaway :) I really want to win!! I think I like the Cha Cha Carnival Camera Strap Slip Cover the best. But that’s trying to boil it down so quickly. I love those and think I’ll have to get one for someone’s birthday soon. She’d love one of those. I love the fruit salad one. I love that fabric! I LOVE these covers…but am thinking the “hoot hoot” is my fav right now. I love the Gothic Rose. You’ve been adding some great fabric, it’s so hard to choose! I’d have to go with the groovy guitars. Thanks for the giveaway! 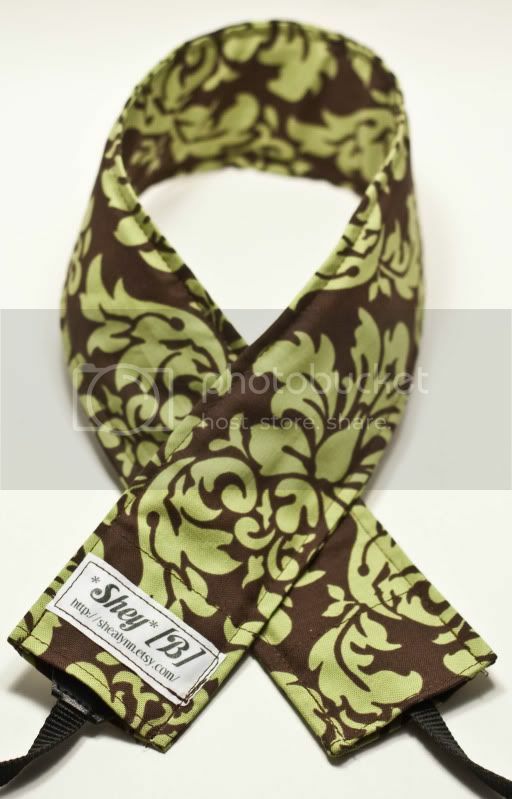 I like this one: Pistachio Damask Camera Strap Slipcover. Thanks, these are quite lovely! I love the one in the Amy Butler lotus print. All of them are gorgeous though! My favorite one is the Fruit Salad Camera Strap Slip Cover, as I love that fabric. I have a bit but as a beginner sewer I’m afraid to cut it and do something with it! What an amazing giveaway–I have been wanting to purchase one of these for awhile now! My fave is the Cloudy Sunset one. Great giveaway! I like any and all of the straps that have bright green in them! Wow – what a great giveaway – thanks! I love the purple one! I love the brown classic. Very nice idea. Hands down – “HOOT HOOT”!!! Moorish Espresso. I love them all, but I would have to get one that my hubby would wear as well, since we share the camera! I love the Woodsy Camera Strap Slip Cover. So sad that fabric is being discontinued! What cute camera straps! Would love to win one! I like French Girlie wallpaper…and I already follow you! Love the disco dots. Gorgeous! I’m really digging Cloudy Sunset (with Fanfare in a close second!). Gothic Rose, French Girlie, Woodsy, Cloudy sunset, Cha Cha Carnival. You said pick your top 5 right? Those are SO cool. My husband and I both have heavier DSLR’s so I am very familiar with that neck pain. Hubby wants to do pro pics someday after he retires. And because Father’s Day coming soon I’m going to resist saying how much I’d absolutely love that purple polka dot cover. Instead, I searched your site hoping to find a Red Wings fabric for him but didn’t see that so I’m going to have to say that I’d love to be the winner of the Firehot strap cover. I’m sure he’d love that too. Thanks for participating in the giveaway. I may never have found your blog. Wow! Love these! Especially the tuquoise and brown damask. And I’m following you now! Love your work. I love them all, French Girlie is so cute, Yoo are the best. I am really excited about this giveaway! I have been drooling over the camera strap covers for a little over a month when I convinced my dh that I wanted one for my DSLR. I told him it didn’t matter which one except my one rule that it had to have black in it. He let my 7 year old pick it out and he the choice was disco dots with tourquise. But my favorite is the Cha Cha Carnival. The Espresso Damask and the Turquoise with Brown Damask – thanks for the chance to win! OK, so I am following you on Twitter – yeah! The problem is picking out my favorite camera strap – My first favorite would be the Feathered Friends, followed by Hoot Hoot, and finally for when my husband is carrying the camera, I must have the Groovy Guitars! I will definitely be back and buying camera straps! I am SO tired of sore neck – especially since I just bought a heavier lens! Thanks for the opportunity to win one! Love the french girlie fabric, but any are just great! Very nice… nice to meet you… nice giveaway! Whoa… that was not easy choosing a favorite. There are too many good options. I would love to wear Espresso Damask around my neck and I would take it with me on vacation, so I could show it off in Paris and Barcelona! My personal favorite is the vintage flower dot! But i would like to win this for a friend, so any of the damask ones would be great (especially the espresso damask)! I think its the Pistachio Damask or the cute flowered one you show on your blog, I didn’t see that one in your shop. i love your giveaway – such a great product to win!!! i was in your shop & it was hard to choose just one i liked – but my favorite was the feathered friends strap …oooh i hope i win!! p.s. i'm going to follow (not just for the extra entries – but i will take them) lol.. The woodsy one for SURE. Such a good idea. I just favorited the item! I love the gothic rose. It would match my mei tai! Vintage Flower Dot is very pretty & I'm a follower for the extra entries! I love the Poppyfield Dream and the Classic black and white damsk w/ stacked yoyo. I can’t decide between the two. They are so cute. I am also following your blog! Great giveaway, your strap covers are lovely. I like the one with owls! I’m just taking this one shot at your giveaway :) thanks for the chance. I love these. My fave is Cha Cha Carnival Camera Strap Slip Cover – 2 SIDED. Too cute! I love your brown and turquoise camera strap…it’s beautiful…would love to win one! thanks for a great giveaway! I love many of them but probably the best for me is Hands of Time. Such a good idea! Oh, I have been wanting one of your camera strap covers for a long time! I love the Poppyfield Dreams one! p.s. I followed your blog! I love the French Girlie print–so cute! green owl hoot hoot or the vintage flower orange dot patterns-soo cute! I love the Gothic Rose Camera Strap Slipcover! What a neat idea! i love your slipcovers!! i am upgrading to a new canon rebel dslr in the beginning of june and what a great way to prettify it!! if i dont win the morning glory one (my fave) i will be back to buy it and a matching lens case!! What a great idea to make the cover’s removable. Love that! I really like the Spring Flowers. Beautiful! I really like the Fanfare slip cover, but it was a hard choice. I’ve hearted you as well. I would be so stylish at all the events I photograph if I was wearing the Lava Leaves Camera Strap Slip Cover around my neck! Great idea! Functional and fabulous! I love it!! I love the classix black and white damask = hard choice though! WOW My absolute fave would have to be the Hoot Hoot Camera Strap Slipcover just because I love Owls but I don’t think it is eligible, so my next fave would be the gorgeous pistachio damask because I LOVE pistachios and Damask LOL!! They are all so darn gorgeous though and I would happily take them all. Being a photographer myself I know how frustrating that strap can be! I forgot to say that I follow you with my blog reader does that count for any extra entries??? I’ve been following for a while! I really really had a hard time choosing, but if I had to it would be Lava leaves! What a great idea about the lens case too! Hey… We both entered each others giveaways! How fun, If neither win, we should do a trade!?! Let me know. Oh, I love the fanfare slip cover….and I have joined as a follower. Your work is beautiful. I spent so long looking at all the beautiful fabrics in your shop! Awesome choices! I like the greens, love the fun prints, I can’t choose. You have great taste in fabrics. What I do love is the little pocket for the lens cap- clever idea! I’m forever trying to remember where to put it. My favorite strap is the cha cha carnival! So pretty! I wanted to win this in the last giveaway day, but no such luck :( Here’s to second chances! I would love to win one in the Cha Cha Carnival 2 sided pattern. It’s beautiful. I love the skull and crossbones. Fits my family’s rocker mentality! That’s a great idea. I always start to feel the neck pinch during an afternoon at the zoo. My favourite from your shop is: Fruit Salad Camera Strap Slip Cover. Awesome! I really like the the white, black, and yellow camera strap. Thanks for the great giveaway. I like the new fanfare! Great stuff! I like too many of your fabrics. If forced to choose, I’d go for the turquoise and brown one. My favourite is the Pistachio Damask one. I love the Poppyfield Dream Camera Strap and the Espresso Damask! How can I pick they are all Great! I follow your blog now! YAY! I sure hope I did that right and entered 5 times! I can’t really decide in ONE fabric… maybe two? French Girlie and Cha Cha… beautiful all of them. I love the Espresso Damask Camera Strap Slipcover, definitely my favourite. I love the Fanfare camera strap. and the green with owls. Your blog is beautifully done, I added you to my blog reader. Gorgeous slip covers! Wonderful shop you have – I love the fabric choices. My favorite cover is the lava leaves!